Jeffrey Kopstein offers the first comprehensive study of East German economic policy over the course of the state's forty-year history. Analyzing both the making of economic policy at the national level and the implementation of specific policies on the shop floor, he provides new and essential background to the revolution of 1989. In particular, he shows how decisions made at critical junctures in East Germany's history led to a pattern of economic decline and worker dissatisfaction that contributed to eventual political collapse. 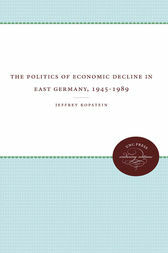 East Germany was generally considered to have the most successful economy in the Eastern Bloc, but Kopstein explores what prevented the country's leaders from responding effectively to pressing economic problems. He depicts a regime caught between the demands of a disaffected working class whose support was crucial to continued political stability, an intractable bureaucracy, an intolerant but surprisingly weak Soviet patron state, and a harsh international economic climate. Rather than pushing for genuine economic change, the East German Communist Party retreated into what Kopstein calls a 'campaign economy' in which an endless series of production campaigns was used to squeeze greater output from an inherently inefficient economic system.